"We live in a time when the words 'impossible' and 'unsolvable' are no longer part of the scientific community's vocabulary." The Big Idea is a first-of-its-kind campaign aimed at propelling the paralysis community into a new era of groundbreaking research. 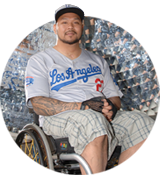 It's a movement to transform what it means for individuals to live with a spinal cord injury (SCI). Exciting update: The University of Louisville has received unconditional approval from the U.S. Food & Drug Administration (FDA) to begin enrolling participants in The Big Idea study that will further explore the life-enhancing effects of epidural stimulation on people with spinal cord injury (SCI). Also, please see the Reeve Foundation Position Statement on Off-Shore Epidural Stimulation Treatments. Download the timeline for epidural stimulation research. 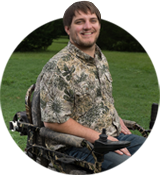 In 2014, the Reeve Foundation unveiled an unprecedented research on epidural stimulation in which four young men living with SCI recovered voluntary movements and the ability to stand. Each participant had a chronic motor complete injury, meaning they were completely paralyzed below the injury level and likely would never recover. That's big on its own - but we're thinking even bigger. Our goal is to raise the funds needed to expand the study and replicate the recoveries experienced by the four epidural stimulation participants to 36 more individuals. Ultimately, The Big Idea's mission is to make this therapy available to men and women living with paralysis worldwide. 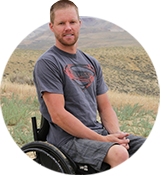 Join the movement now by donating to help fund this research and support the paralysis community. Like many historic breakthroughs, the effectiveness of epidural stimulation to improve autonomic functions (bladder, bowel, sexual and temperature) was discovered by accident. In fact, the original study was designed to promote stepping and standing. Rob, Kent, Andrew and Dustin were all diagnosed with a chronic complete motor SCI before their participation in the initial study. They were given no hope of recovering autonomic functions or regaining movement. But our research partners at University of Louisville and UCLA made an unexpected discovery - all four men observed huge improvements in their ability to control autonomic functions and move their toes, feet and legs on command. This recovery challenged the notion that the spinal cord, once damaged, could never be repaired and signaled an unprecedented breakthrough for the field, as well as new hope for the millions living with paralysis. As reported in the initial study with the first four participants, epidural stimulation led to the recovery of critical functions like improved bladder and bowel control, sexual function, and temperature regulation. When stimulated, the participants can also voluntarily control their legs and bear weight. Most importantly, their lives have been transformed with improved health and quality of life. Is it a cure? Not yet. The next step is to fund a new study with 36 additional participants - men and women of a range of ages and diverse backgrounds - to prove beyond a doubt that this therapy is viable. This will allow us to expedite epidural stimulation to the clinic. Meanwhile, there are efforts underway to develop more sophisticated technology that may allow people living with SCI to maintain balance, continue to bear weight and work toward stepping in the presence of epidural stimulation. When you understand what it's like to live with paralysis, deciding to fund and support this breakthrough research is easy. Now that the FDA has provided approval for The Big Idea, researchers can begin to enroll participants in this study. While this is a tremendous milestone for the Reeve Foundation and our community, we have yet to reach our fundraising goal to complete the study. We have committed to moving forward with the hope and faith that our most ardent supporters will continue their commitment so that this research can carry on without disruption. 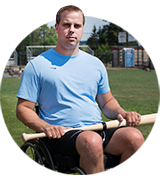 Your donation will provide life-changing epidural stimulation therapy for 36 new participants. 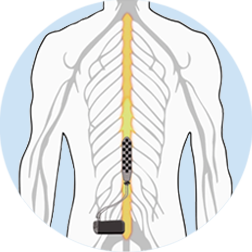 At the end of this study, we will have a critical mass of data needed to propel epidural stimulation to the forefront of care for people living with paralysis. The ultimate goal of this research is to demonstrate the efficacy of epidural stimulation and lay the groundwork to get this therapy to the clinic. This is your chance to change the lives of individuals who were told nothing could be done for them. See real-life success stories and track the progress of The Big Idea by following us on Facebook, Twitter, YouTube, and Instagram. And tell everyone you know to show their support by posting with #JoinReeve.